Second, there’s all the reactions of the substituents on aromatic rings. 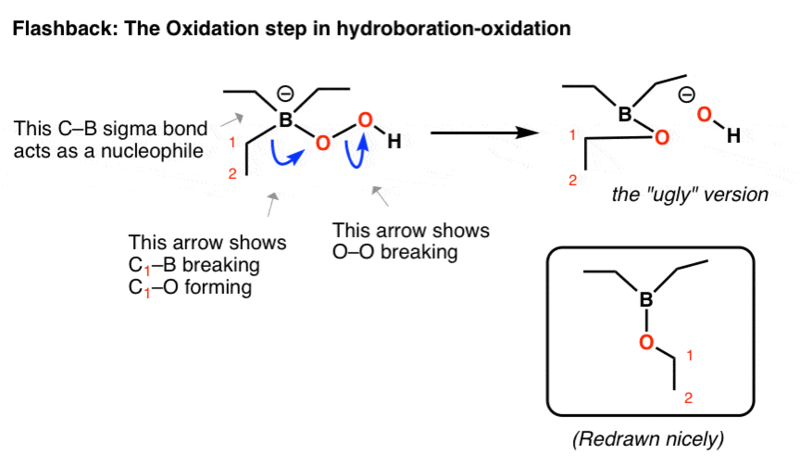 We covered reduction of carbonyls to methylene (CH2) carbons in a previous post [link], as well as oxidation of benzylic C-H bonds to C-Br and C-O bonds [link]. For instance, we saw that reducing the C=O to CH2 has a tremendous impact on the reactivity of the ring, since it converts a deactivating meta– director into an activating ortho- , para– director. and conversion of ketones to esters, a reaction known as the Baeyer-Villiger Oxidation. Why are these reactions important? The ultimate aim of learning reactions is to able to apply them in the synthesis of molecules of our own design from simpler, cheaper components. Each reaction is a “tool” that serves a specific purpose in allowing the formation and breakage of a certain characteristic set of bonds. The more tools you have in your “shop”, the greater the power you have in designing syntheses of organic compounds. 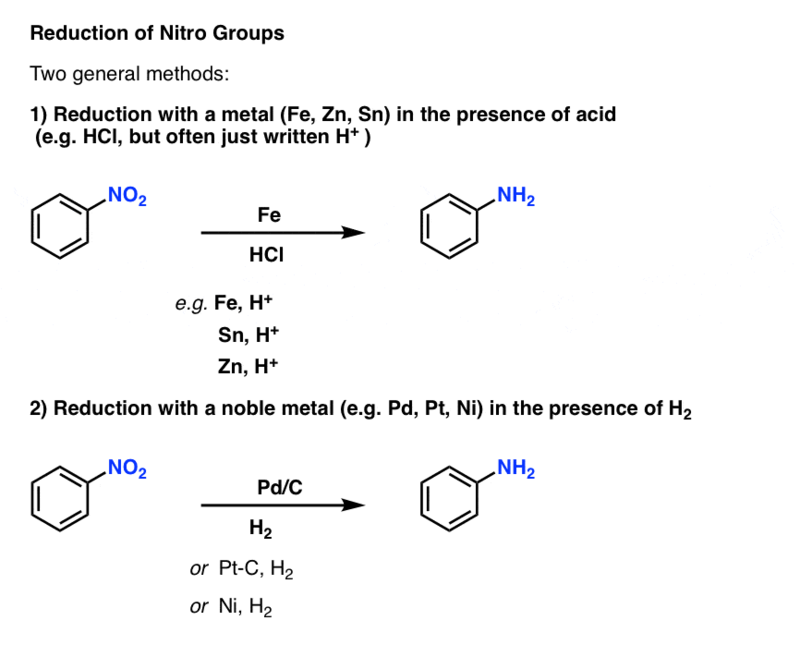 Addition of an easily oxidized metal like iron (Fe), tin (Sn) or zinc (Zn) in the presence of acid, such as HCl (but often just written, “H+ “) will convert NO2 to NH2. Hydrogenation over a palladium, platinum, or nickel catalyst will also convert NO2 to NH2. One slight advantage of using catalytic hydrogenation is that it can be conducted at neutral pH, and therefore doesn’t affect acid-sensitive functional groups. One of the most important features of the reduction of nitro groups to amines is that it converts a strongly deactivating, meta-directing substituent into a strongly activating, ortho-, para- directing substituent. As it turns out, however, this can actually introduce some new problems! First, the amino group is so activating that electrophilic aromatic substitution reactions can occur not just once, but multiple times, resulting in undesired products. 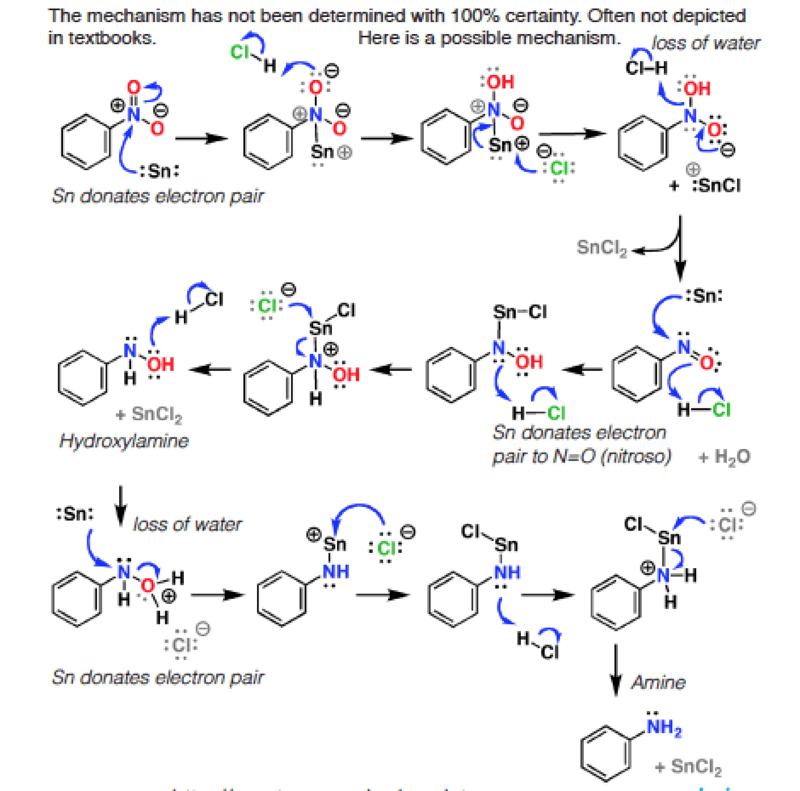 Secondly, the lone pair on the amine is basic. 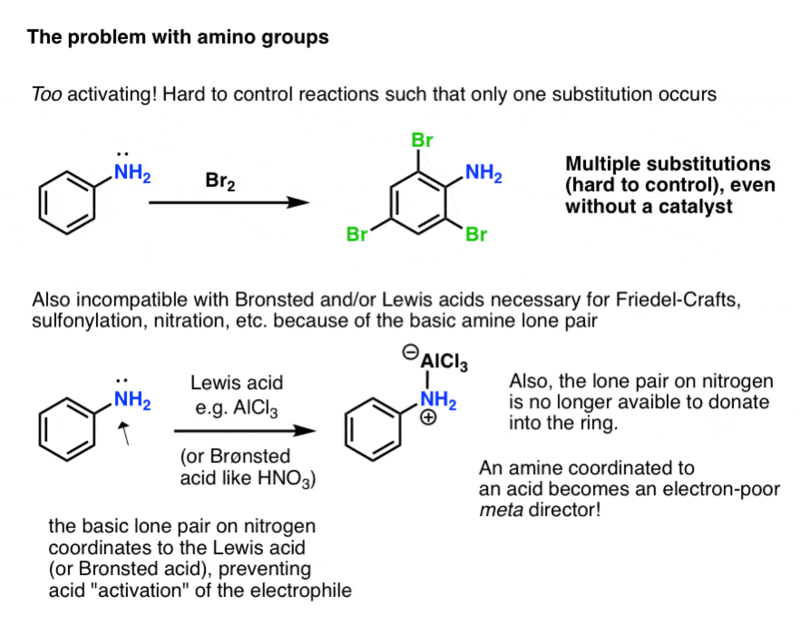 Reactions that require a Brønsted or Lewis acid catalyst (such as the Friedel-Crafts reactions, sulfonylation, or nitration) don’t end up accelerating the reaction of the electrophile, but instead result in the coordination of the acid to the amine lone pair! Furthermore, this means that the lone pair on nitrogen is no longer able to donate into the aromatic ring (through “pi donation”). Since nitrogen is more electronegative than carbon, the nitrogen coordinated to an acid is electron-withdrawing and actually behaves as a meta– director! So how do we tame the “wild horse” that is a free amino substituent? Fortunately, it’s fairly easy. One common method is to convert the free amine into an amide with a reagent such as acetic anhydride (Ac2O). 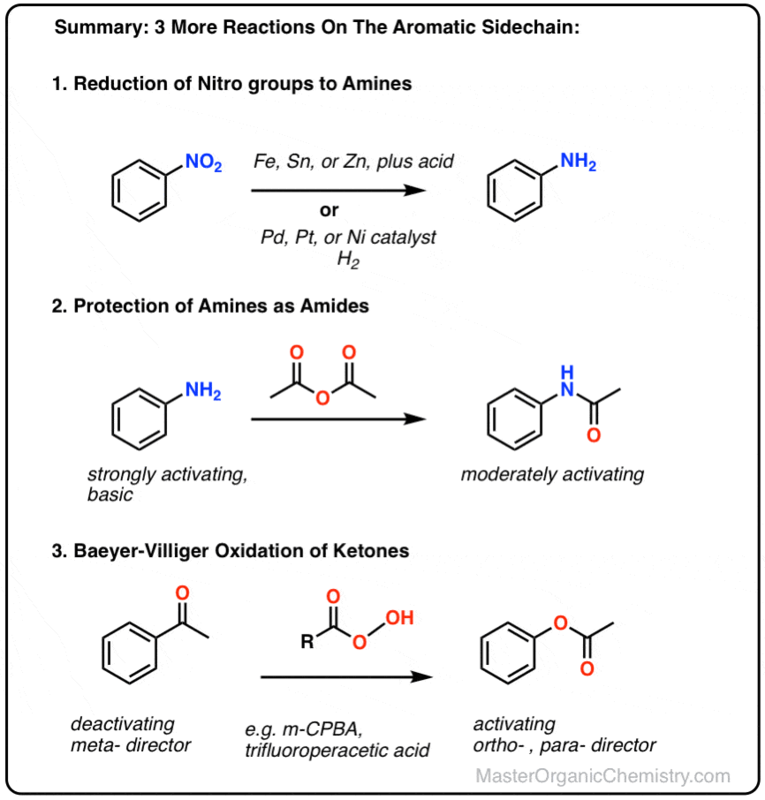 The resulting amide still an ortho- , para– director (note that lone pair on the nitrogen!) but not nearly as activating as the free amine. Furthermore, amides are much more compatible with Bronsted and Lewis acids than free amines. If the free amine is desired afterwards, it can be obtained by subjecting the amide to acidic hydrolysis (water, H2SO4, heat). 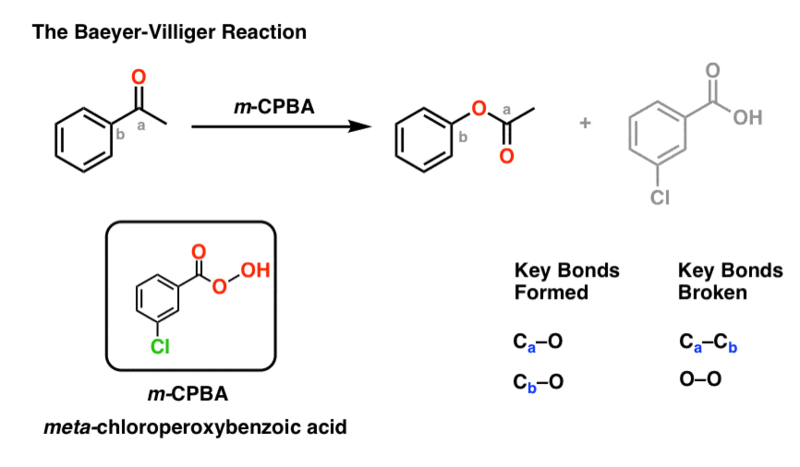 The Baeyer-Villiger reaction fills in an important gap in our “toolbox” of synthetic methods. Up to this point, we’ve learned how to form C-C, C-N, C-S, and C-(halogen) bonds on an aromatic ring, but not C–O. 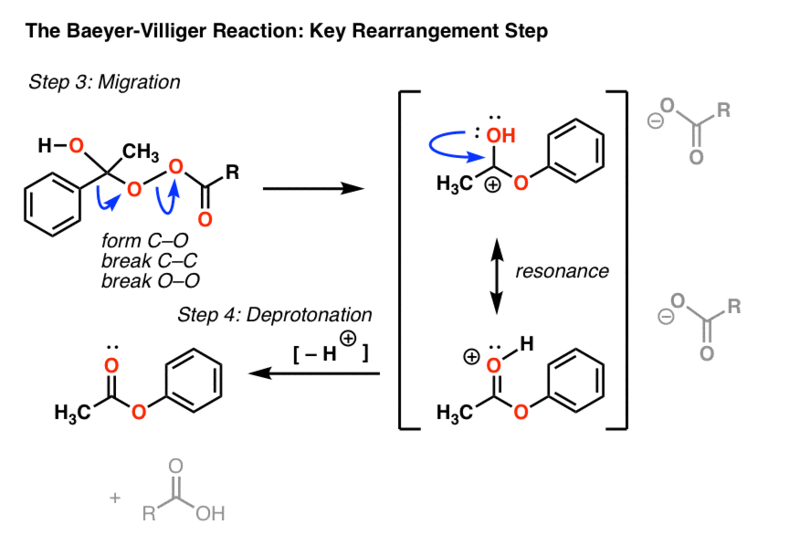 Also note that the Baeyer-Villiger, like the reduction of nitro groups to amines, converts a deactivating, meta-directing carbonyl group to an activating, ortho-, para- directing oxygen (those lone pairs on the oxygen are capable of pi-donation). Now the fun part. How does it work? Now comes the key rearrangement step. In this step, a sigma bond acts as a nucleophile, attacking oxygen and breaking the weak (about 35 kcal/mol) O–O bond. Great question! This is such a great question that answering it will go a little bit beyond the standard course material, so I’ll address this in the notes below. To explain in brief, there’s a general trend between migratory aptitude and carbocation stability (with the big exception of phenyl). An approximate order of migratory aptitude is: tertiary carbon (fastest) > secondary carbon, aryl (e.g. C6H5)> primary carbon > methyl (slowest). (later in the course (amines), you may encounter the Beckmann, Hofmann, Curtius, and Schmidt rearrangements, which occur through a similar migration step). Where have we seen a rearrangement step like this before? It’s this last example which is most relevant here. I advise drawing the “ugly” version first to get the connectivity right, and then redraw it nicely. Make sure you can tell the difference between amides and esters that are ortho-, para- directors, and amides and esters that are meta– directors. an atom attached to an aromatic ring that bears a lone pair will be an ortho-, para- director, since it is capable of pi donation into the ring. So an amide with N connected to the aromatic ring or an ester with an O attached to the aromatic ring will be ortho-, para– directors. A carbonyl attached to an aromatic ring will be a meta- director, since it can accept a pi bond from the ring. So an amide or ester with the carbonyl attached to the aromatic ring will be a meta director. 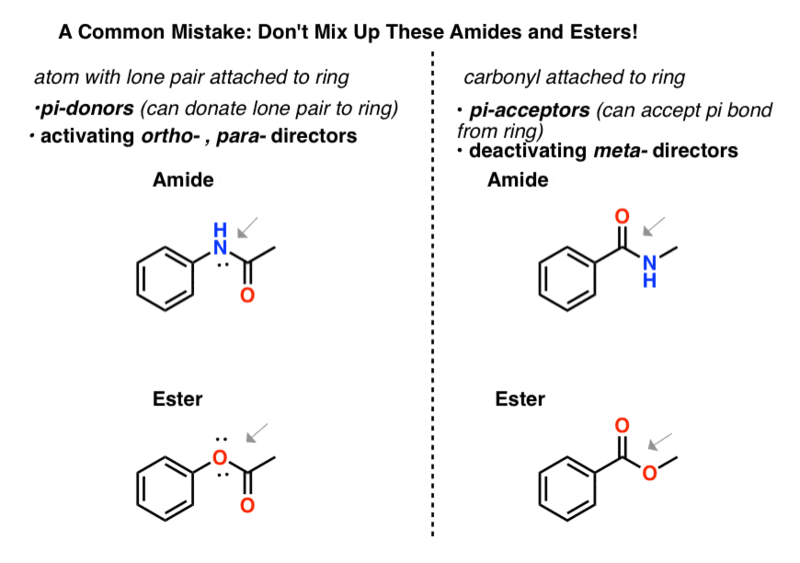 Don’t get these two classes of amides and esters mixed up! Believe it or not, we’ve pretty much come the end of covering substitution reactions on the ring and also reactions of aromatic substituents. It’s time to start putting these reactions together into sequences, and try our hand at the synthesis of aromatic molecules. With all these reactions in our toolkit, we’ll be able to accomplish quite a lot. In the next post, the first on aromatic synthesis, we’ll cover some of the basic principles. The second and third posts will cover some synthetic strategies. Finally, we can devote some time to practice problems. 2. The C-O (pi) bond formation is technically just a resonance form , so one could alternatively draw it as a concerted process. [Click here to have an image pop up of this step drawn with the C-O pi bond participating]. OK, this is pretty far beyond introductory course stuff, so feel free to skip. Still, the question remains: why the weird order of migratory order in the Baeyer-Villiger? It (mostly) goes in the familiar order of carbocation stability (tertiary > secondary > primary > methyl) except that aryl is intermediate between secondary and primary. By now we’ve seen lots of examples that show conclusively that aryl carbocations are more unstable than primary carbocations. So what gives? As we’d expect from this mechanism, electron-donating groups on the aromatic ring (such as O–CH3) speed the reaction relative to C6H5 itself, and electron-withdrawing groups (such as NO2) retard the rate. To go even deeper we can look at the orbital picture of an alkyl migration in the Baeyer-Villiger. This begins with the C–C bond aligned in an anti-periplanar arrangement with the O–O bond. The C–C bonding orbital then begins overlap with the O–O antibonding orbital, leading to a transition state where there are three atoms sharing two electrons! (This is called, not surprisingly, a “3-center, 2-electron bond”. The stability of this transition state is directly related to how well the three groups on the alkyl carbon stabilize positive charge. Hence, tertiary (as well as allylic and benzylic) carbons migrate fastest, followed by secondary, primary, and methyl. The migration of an aryl group involves more than just the C–C sigma bond; the p-orbital on the carbon can get involved as well! So what happens in this transition state is that the p-orbital donates into the O–O antibonding orbital, leading to a transition state where the positive charge is spread out over the five carbons in the aromatic ring; not a 3-center, 2-electron bond, as before. As you can imagine, electron donating groups “X” such as OCH3 stabilize the transition state (increasing the rate) and electron-withdrawing groups such as NO2 destabilize the transition state (slowing the rate). 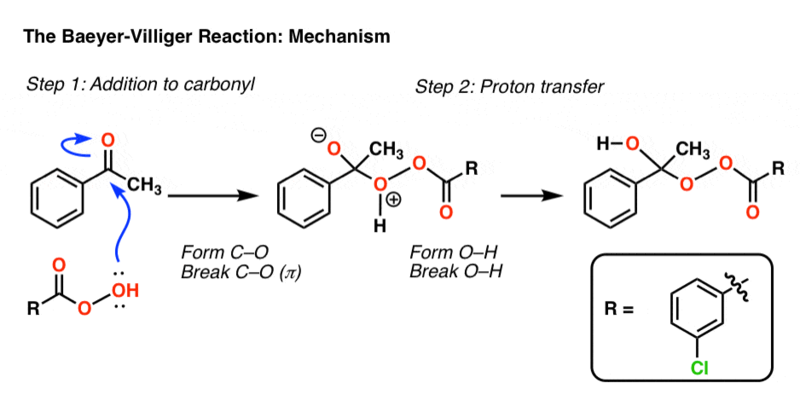 Theoretical organic chemist Henry Rzepa has a useful blog post discussing the mechanism of the Baeyer-Villiger (particularly the proton-transfer step) here.